River landing is an attractive destination year-round. This is a popular location for bird watching, canoeing (please use the canoe dock), fly-fishing access, people-watching, picnicking, reading, sunbathing, etc. River landing has been managed to show its presettlement vegetation. The landing demonstrates a fresh approach to bank stabilization. Heavy use, lack of vegetation, the natural flow of the river, and other factors all contributed to severe degradation of the banks. River landing shows the combined use of rubble removal, regrading, erosion control blankets, shoring up with groups of native plants, live stakes, plugs, and seeds.. 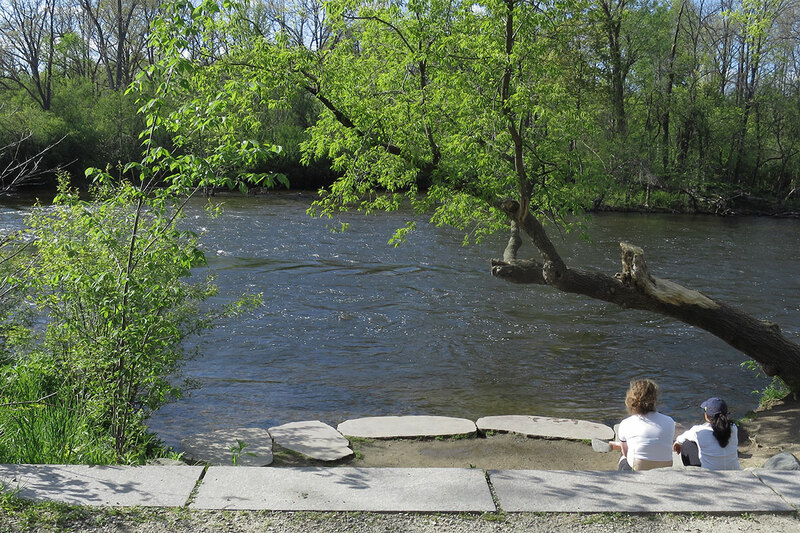 The riverfront is the result of a collaboration: in part, it served as a demonstration project in Washtenaw County by the Southeast Michigan Resource Conservation and Development Council. The entire project, completed in 2006, engaged county and city agencies, private design firms, nongovernment organizations, the University of Michigan, public and private funding, and the expertise and efforts of volunteers.